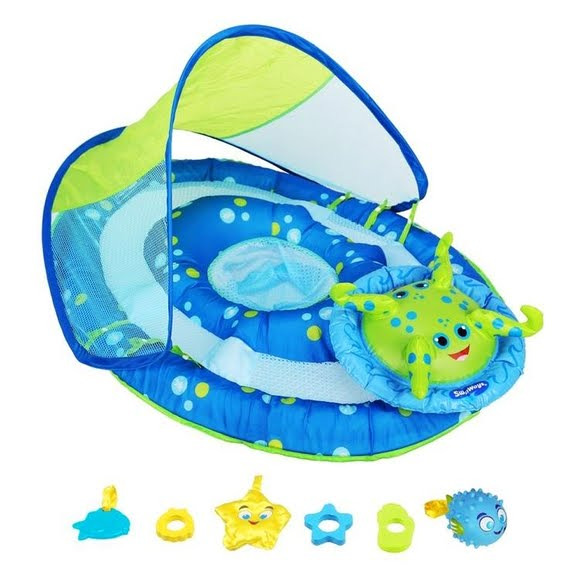 The Swim Ways' Baby Spring Float Activity Center is the ultimate way to introduce your baby to the water (and an engaging play pal! Mesh play space for toys and splashing. Dual inflation chambers and low seat enhance security. Three-position adjustable, removable canopy offering UV protection. Interactive play station with activities for every developmental stage. Octopus arms hold toys baby can touch and activate: squeaker, rattle, stacking rings, teether and soft touch star. Folds easily for storage in included carry bag.